#1.1 7 Best Steelwater Gun Safes on the Market! #1.2 Why Choose Steelwater for Your Next Gun Safe? The purchase of a safe is one of the most responsible decisions that any gun owner could make. You want to make sure that your firearms don’t wind up falling into the wrong hands plus you want a location that allows you to store other important and valuable things. This is where a safe can truly come in handy. Of course, not every safe is built the same, and not every company making safes are ones that you can depend upon. Steelwater has long established themselves as one of the industry leaders in making quality gun safes, and this is why millions of customers turn to them each and every year. 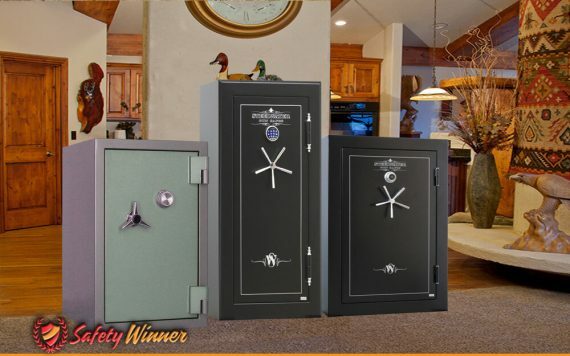 7 Best Steelwater Gun Safes on the Market! It’s pretty easy to find Steelwater to be the perfect brand for your home or business. Of course, you may be looking for a specific kind of safe to fit your security needs. Here are seven options you definitely want to consider. Contains heavy duty steel body that is impact and drill resistant. Provides a quality EMP electronic lock with backup key. A dehumidifier is included as part of your purchase, protecting your valuables from moisture. Provides up to 60 minutes of protection from fires up to 1875°F. Provides capacity to hold up to 20 long rifles. Not the best design on the interior. Really only provides room for about 10 long rifles. Is a little tricky to try to secure to the floor, as the safe could fall on you if you aren’t careful. Many dissatisfied that the safe is made in China. Steelwater has designed a number of great gun safes, and this is one of the very best that you are going to find. Truly a great example of how their reputation has been built on quality and exceptional design. Starting with the interior, you will love that it comes with an LED interior lighting system, which is activated when the safe door is open and will shut off when there is six minutes of inactivity around the safe or when the doors closed. This helps to make it more eco-friendly. The safe comes with customizable shelving to allow you to organize your items to fit your needs. Plus, the door comes with six different holsters for handguns and six pockets included. Plus there are straps and key holders to make organization even easier for you. The exterior is built of a 14gauge steel construction, giving you a durable safe that you know can withstand heavy impact. The door has a composite constructed steel that is 5 inches thick, and has two layers to ensure that people are unable to drill their way through or to pry the door loose. In fact, the door is held in place by seven steel locking bolts which are each 1.5 inches thick. No one is prying this door loose without heavy duty equipment. Included are seven chrome plated bolts that help you secure the safe in place, all additional hardware that is needed to secure the safe is included as well. Access to the safe comes through a electronic keypad that allows you to program your own code from anywhere from 3 to 8 digits. This allows you to make the code even more difficult to try to figure out. Plus, a backup key is included to provide emergency access. Built to protect your valuables, including the use of plates that are ¼ inch thick. Provides optimal fire protection of up to 120 minutes. Door secured with 13 ½ inchlocking bolts. Plenty of storage space included in the interior, and it is carpeted to protect valuables. Can hold up to 22 firearms. Includes internal outlet source, removing the need for you to drill a hole to add an outlet. This safe is extremely heavy, weighing nearly 600 pounds. Once positioned, you’re probably good have to leave it there. The plug protrudes inside the safe. 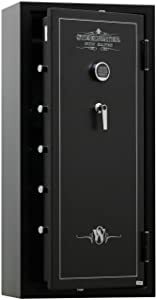 If you are looking invest in a heavy duty safe that is built to protect your valuables from fire as well, then you can be sure that this is the option for you. This is truly a safe that you will come to love, as it gives you all of the features and protections you could possibly want inequality gun safe. Starting with the interior, the safe is 59 inches tall, by 39 inches wide, by 24 inches deep. This gives you plenty of storage space for up to 22 different rifles, plus you still have storage space on a shelf that is fixed near the top of the safe. The door has holsters for five different firearms, and there are five additional pouches where you can put magazines or ammunition. The holsters are attractively designed to make sure that the handle is out, making it easy to grab in an emergency. The interior is fully carpeted, adding additional protection for your valuables. Included is the framework to be able to put up additional shelving, which includes a five position gun rack. The exterior of the safe you are going to love. 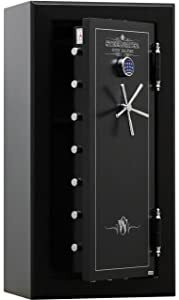 The framework of the safe is built of a hard, durable steel, that is ¼ inch thick. This makes it drill proof and impact proof, assuring you that your firearms and other valuables are going to be Secure. Not only does the plates ensure that you get protection from burglary, but also provides you with one of the highest quality fire protections on the market. This safe is intended to provide you with 120 minutes of protection up to 1875°, plenty of time for firefighters to reduce the flame before any damage occurs to your valuables. 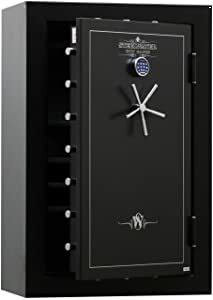 The safe uses a high-quality EMF mechanical locking system, and 13 bolts hold the door secure, making it pry resistant. No doubt you’re going to get every advantage with this safe, and you can be sure that it will protect your valuables to the highest degree. Provides high capacity in terms of storage of firearms. Door seal is heat activated to protect your valuables. Hard plate makes this safe one of the most impact resistant you will find. Bill to give you maximum storage and help you to stay organized. You will love the customization that it provides inside the safe. Adds a number of technological advancements to help improve security. While it touts the ability to hold 39 guns, you will likely find that this is hard to accomplish. This safe is extremely heavy weighing almost 700 pounds. Exceeds the California standards for residential security containers. Many are convinced that a combination lock is not the way to go in a safe, but there are those who find this type of locking mechanism to be ideal, as long as they get the group 2 kind. This is just one of the reasons why you will love this safe option. It starts with the fact that it is able to store up to 39 long rifles inside the safe, and you can have confidence that if you are storing this many rifles that no one is going to easily work their way into your safe. The safe is built with one a durable gauge steel, that is reinforced with up to ¼ inch reinforced plates. The interior of the safe is absolutely fantastic. While most safes give you the capability of customizing the shelves on one side of the safe, you can do this throughout the entire product in this beauty. This gives you the capability to completely organize the safe to fit your needs. That starts with the door panel that has seven different holsters included inside the door, which enable you to be able to quickly grab a firearm in an emergency. For small pockets, for medium-size pockets, and one larger sized pocket are included as well. No doubt you will be able to easily keep your valuables secure, safe, protected, and organized. There are a number of technological advancements included in the safe as well. A digital keypad provides the highest level of security, and there are 13 1.5 inch bolts that hold the door in place. Two USB ports are included in the interior of the safe, and a UL outlet is included as well. Plus, the safe provides up to 60 minutes of protection at temperatures of 1875°F. This is everything that you could want in a safe and more. Why Choose Steelwater for Your Next Gun Safe? Build Quality Products. Most of the safes that they have to offer come with lifetime guarantees. This tells you that the maker stands behind their product, and Cannon has built a reputation of dependability, giving you confidence that the safe you are buying is one that will protect your valuables. Fire Resistance. Steelwater builds safes that have been known to resist fire for up to 120 minutes at temperatures reaching nearly 1900°. This kind of prolonged protection ensures that you have plenty of time for emergency personnel to put a fire out before any item inside your safe is damaged or destroyed. Attention to Detail. One factor that has really separated this brand from others is their attention to detail. Every safe is checked for any defect before it leaves the warehouse, letting you know that you are getting a quality product each and every time. Range of Sizes. Whether you are looking for a safe that can hold a few handguns and some other valuables or you need one that can hold up to 60 long guns, you can be sure the Steelwater has the right safe for you. Plus, you can be sure that the quality will be extraordinary regardless of the size of the safe. Construction. Attention to detail also means that the very best materials are used in construction of the safe. You are going to get high gauge steel, anywhere from 9 gauge up to 14 gauge, and they are made with a level of thickness that prevents people from gaining unauthorized access into the safe. Great Look. Because so much attention is paid to the details of their safes, you will love the look. Not only on the interior, but also in the exterior. These are beautifully designed products that show the maximum level of craftsmanship, and each interior is built to give you a good look and a functional use. How to Bolt Down a Gun Safe for Maximum Protection?